Between 1790-1795 the cost of sinking shafts from 7 yards (6.4m) to 67 yards (58m) deep as at Ballyfield colliery was between 5s (25p) and 67s (£3.35) a yard deep for tools, powder and labour and of course could be very expensive if a water problem was encountered where ginging or stopping out, beating out or framing out was resorted to. Clay and wood would be packed behind and garlands or spirals built behind the ginging collected water in wet shafts and was delivered and collected to a pump cistern instead of allowing the water to get to the shaft bottom. Sinking of ‘trial pits’ at this time was almost as cheap as boring for the coal at this time as the coal section could be examined in detail and many shafts were sunk for exploration and then abandoned without the seam being exploited. In parts of Derbyshire the only certain method of finding a coal seam was its relationship to the known Millstone grit rocks. On Eyre’s (Estate), Dronfield Woodhouse, the Blackshale pit was sunk around this time. Began sinking Gregory Mine, Ashover in 1791 and it was to prove very expensive at a cost of £4,000 to sink 266 yards (243m), finishing in 1795. In the early days of mining divining rods were resorted to as well as other superstitions. Although boring for coal had been invented by Willoughby of Wollaton many years before, it appears that the East Midlands Coalfield was behind other parts of the country in searching for coal. 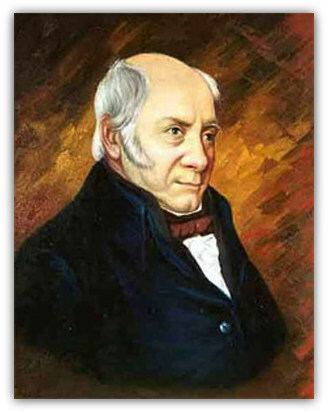 James Oakes established Alfreton Ironworks at Riddings, (Derbyshire) in 1792. On 30th July of that year 1792 the first sod of the Nottingham Canal was cut and wharves were opened in 1793. The Cromford Canal (1789-1794) originated by Arkwright, and the Nutbrook Canal (dug out 1792-1793, opened 1796) from Shipley to the Erewash Canal and Langley Bridge to Jacksdale were also started. The Pinxton Canal was 26 feet wide (7.9m) and 7 feet (2.13m) deep and the new barges were 80 feet (24m) long x 7’ 2” (2.18m) wide x 3’ 6” (1.07m) deep, capable of carrying 50 tons of coal. The wharf at the canal side was named after the Duke of Portland. The Rev’d D’Ewes Coke (1791-1811) of Brookhill Hall had originally promoted the Canal. 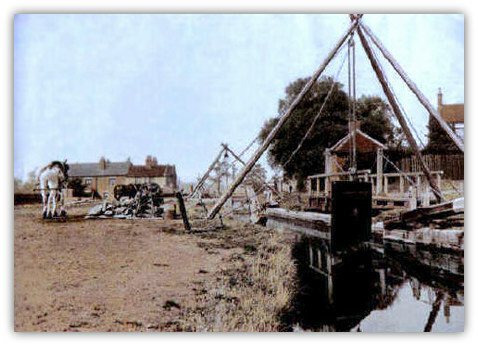 An Engine pit was sunk in 1792 between the Erewash Canal and the River Erewash South East of Ilkeston and a roadway named the Bennerley Level was driven from it in a south easterly direction. Barber Walker and Co built a canal called the Bilbro’ Cut during 1793 from Bilborough colliery (later renamed Hollywood), to the Nottingham Canal. During the same year a branch waggonway to Horsley colliery was authorised but was never constructed. By autumn of that year the Ashby Canal in South Derbyshire was opened and was paid for by the Earl of Moira, later the Marquis of Hastings, also Colonel Hastings and Joseph Wilkes. 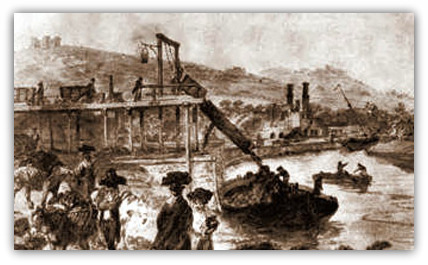 Although it was a busy waterway transporting coal and other goods it was not to make a profit for the entrepreneurs until 1828. Also in 1793 a company was formed to continue the Ashby Woulds Canal into Warwickshire. The efficiency of goods carried by barge in relation to other forms of transport can be seen. A single pack horse could carry two panniers of coal, total weight say 2½ cwt whilst a wagon on a soft road hauled by horses could carry around 12½ cwt. 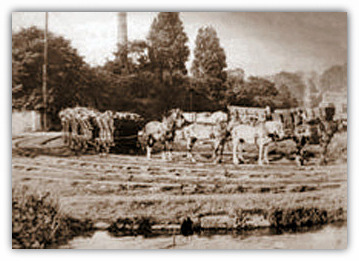 A stage wagon on a tarmacadam road could carry about 2 tons and a wagon on iron rails around 8 tons whereas a barge on a river could manage 30 tons but a barge on a canal could transport 50 tons pulled by one horse. On 20th June 1793 Francis Rawdon Hastings became 2nd Earl of Moira. He owned pits at Oakthorpe. He went into partnership with Joseph Wilkes who also owned pits at Oakthorpe. Baron Rawdon’s mother married Lord John Rawdon on the death of her brother Francis Hastings 10th Earl and succeeded to all the titles etc. The famous Tramway from Derby to the Canal at Little Eaton opened in 1793. It was authorised by an Act of Parliament and was built by Benjamin Outram. There were 8 waggons at 5 feet 9 inches (1.75m) by 3 feet 7½ inches (1.1m) by 2 feet (0.61m) plus a 1 foot 5 inches (0.44m) high side extension and hauled by a team of horses and the whole carcass was off-loaded into barges by derrick. The tramway was in use for 115 years until July 1908. Due to the War with France (that lasted to 1802) there was a shortage of coins and John Brocksopp the owner of Hasland colliery just south of Chesterfield, had to obtain coins of small denomination from the local traders in order to pay his workers. Beaumont seized Newbold colliery and relieved Boultbee of his post because of major irregularities at the mine. William Hawley, killed in a coal pit at Bilborough ? Oct 1793. John Roper and William Fenton left Leicestershire field and also sold Aldercar pits (North Derbyshire). Roundabout this time Wilkes who had pits at Measham (Leicestershire) purchased Old Brinsley colliery (Nottinghamshire). Seeing a good outlet for his coal he built a railroad from the pit to Langley Bridge. Stanton (Burslem and Sketchley) Newhall, Main coal. Old Engine and Bye pit 80 yards (73m) to Ripley old Hard coal. Beaumont re-opened Coleorton old colliery. Wilkins opened a small slack pit at Measham for his lime works but it was closed in 1796. Sir George Beaumont owned a colliery at Lount. William Smith (son of a blacksmith, born in the hamlet of Churchill, Oxfordshire on 25th March 1769) said to be the ‘Father of Geology’, having spent much of his time examining rocks and fossils in the Coalfield around Bath.He was on his travels around England checking on various rocks and visited a mine at Hisley Wood in Derbyshire, belonging to Lord Fitzwilliam, and stated that he was let down the pit in a basket. Smith was the first to note that certain fossils in the various layers of rock could be identified in similar layers elsewhere thus confirming that the layers were laid down in a particular period when these creatures were alive. 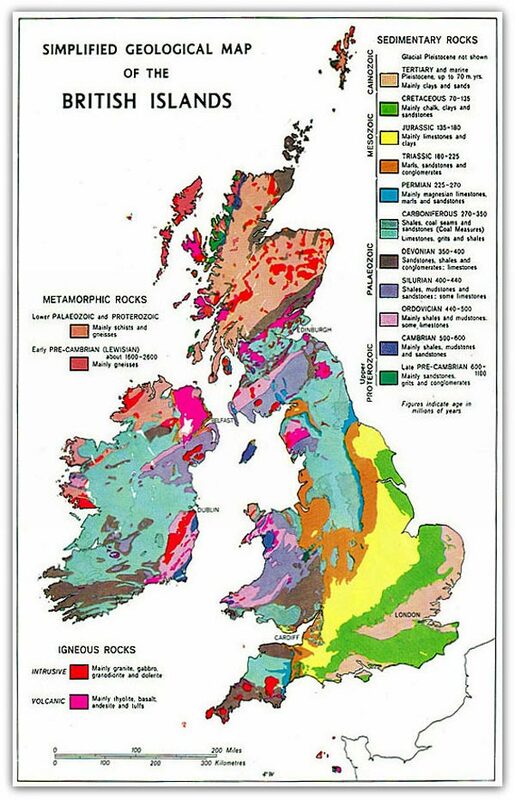 He would eventually produce a map of England showing all the exposed rocks etc that was so accurate it would be almost identical to one produced later by the Geological Survey in 1899. His student John Farey did much work in identifying the collieries. The Codnor Park collieries (North Derbyshire) began working in 1794. These were shallow pits between the Langley Bridge Canal and Codnor Castle and taken out by Butterley Co (Outram and Partners) on a 63 years lease from the Rev’d L Hoskins Masters. The pits were exhausted or worked out by 1856 - i.e. 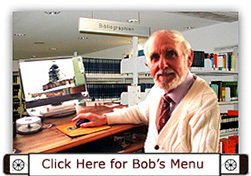 62 years! The working of the coal would have been done by hand got methods using primitive tools and without the use of any machinery at all, the only illumination would have been tallow candles, and the miners were paid between 2s 4d (11½p) and 2s 6d (12½p) a day. New ironworks were built at Riddings and Butterley by the canal side. The Cromford Canal (opened Aug 1794) junction with the Erewash Canal at Langley Bridge to Cromford was just short of 14¾ miles long. There were 14 locks and 3 aqueducts and 4 tunnels along the route and rose to the summit at Ironville and passed through a 1¾ mile long Butterley tunnel driven 300 yards (275m) directly beneath the ironworks furnaces whereby material such as iron products could be loaded directly into barges via small shafts and limestone hauled up. There was a branch Canal to Pinxton about 2½ miles long. General goods as well as coal, lead and limestone were transported by barge. The Canal was also driven to Carr colliery terminating at a wharf where the coal was loaded into small boats. The Canal also assisted in draining the mines as water pumped from Butterley Park pits to near the east portal. Two loading shafts at Butterley were worked by horse gin, later worked by Whimsey engine but would be closed by 1840. The Soar Navigation was completed beyond Loughborough to Leicester in February but was not opened for traffic until October 1794. Coals were often sold at the pithead of the collieries, to persons who would bring along their own wagon and team to purchase the coals at so much a corfe or box instead of being weighed. At some of the larger collieries a weighing machine would be available, but as at Tibshelf and other places, the coals were stacked on the ‘hill’, in what was called threequarter stacks of 6 feet (1.83m) long, 3½ feet (1.07m) wide and 5 feet (1.52m) high, that were said to weigh 44 cwts (hundred weights) at the engine when freshly drawn and 41 cwts when dry. Note there are 20 cwts to a ton. It would appear that most of the miners were ‘diddled’ to some degree by having to produce more coal than was ‘agreed’ on. Possibly it was easy to dupe the majority because they were uneducated and did not understand weights and volumes etc. Thomas Gough came to South Derbyshire from the Forest of Dean in the late 18th Century to sink pits and explore. He brought with him a team of men including experienced sinkers who sank several small shafts in the area and worked some coal. More pit ponies or donkeys were introduced at mines in the region to haul tubs of coal from the working places to the pit bottom. Bilborough, William Wane killed in a coal pit, buried 30/12/1794. The Skegby Colliery Co sank the 4 or 5 shafts called Shilo or Shiloe colliery close to the River Meden in 1795 but some of the shafts were closed after only 5 years work as the miners came across unexpected gobbings or old works - the coal had been worked many years before! Some coal getting was able to carry on in this area after 1811, from Skegby Wharf colliery as mentioned by John Farey. There were several faults to negotiate, and these were recorded as ‘up 5 yards (4.5m) to the southwest, down 6 yards (5.5m) to the southwest and up 22 yards (20m) to the southwest’, making it rather a tortuous route for the haulage of the coal back to the shaft at Skegby wharf. The Old Engine pit was sunk 33 yards (30m) to the Swanwick Hard coal (Top Hard) at Swanwick. The Old Colliery was 120 yards deep; also Gregory Mine, Ashover completed sinking. Thomas Woodward died in 1795 and left his coal mine at Gresley, situated about 1 mile northeast of Church Gresley near Common Side and noted as Woodward’s Close colliery by Farey in early 1808. Round Hole colliery nearby was worked by Gresley. Coleorton colliery, re-opened in 1794 was closed again.